Intravascular ultrasonography (IVUS) is an invasive imaging procedure that provides intravascular images of the coronary arteries and other blood vessels. Intravascular ultrasonography has played a critical role in enhancing the understanding of coronary atherosclerosis pathophysiology and has facilitated the refinement of diagnostic and therapeutic strategies for various vascular pathologies. Intravascular ultrasonography has become increasingly important in both clinical and research applications,  and it has played an integral role in the evolution of interventional cardiology. [2, 3] Intravascular ultrasonography in interventional cardiology is an adjunctive procedure to coronary angiogram; as such, any contraindication to coronary angiography applies to intravascular ultrasonography as well. In general, risks and discomforts involved in IVUS include those associated with all catheterization procedures. Major complications, including dissection or vessel closure, are rare (<0.5%). The most frequently reported complication is transient coronary spasm (occurring in 1-3% of examinations), which responds to intracoronary glyceryl trinitrate. A still intravascular ultrasonography image demonstrating a normal coronary artery. Preinterventional intravascular ultrasonography imaging allows the assessment of plaque distribution, ostial involvement, lumen and vessel area and diameters, extent of calcification, and the presence of thrombi or dissections. [5, 6, 7] It can alter strategy and the decision to use a particular device. Two major trials, the Strategy for Intracoronary Ultrasound-Guided PTCA and Stenting (SIPS) trial and the Balloon Equivalent to Stent (BEST) study evaluated the potential benefit and demerits between ultrasound-guided balloon angioplasty and routine stenting. [8, 9] In the SIPS trial, approximately 50% of patients in each group received a stent at the time of the index procedure. 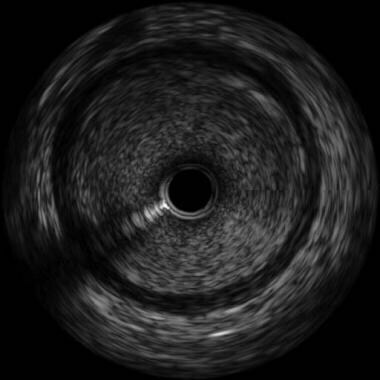 Acute gain was greater in the IVUS-guided group than in the angiography-guided group, but angiographic 6-month follow-up revealed no difference in the primary endpoint of minimum lumen diameter. Although no difference was noted in the secondary endpoint of short-term target lumen revascularization, long-term clinical follow-up showed a significant decrease in clinically driven target lumen revascularization in the ultrasound group compared with the angiography group. In the BEST trial, at 6 months, 20 of 119 patients in the aggressive balloon angioplasty group and 21 of 116 patients in the routine stent implantation group had restenosis, along with no statistical difference in minimal luminal diameter or lumen cross-sectional area, thus fulfilling the prespecified criteria for noninferiority. The Multicenter Ultrasound Stenting in Coronaries (MUSIC) study established the safety and feasibility of intravascular ultrasound-guided stent implantation. Fitzgerald et al evaluated whether routine ultrasound guidance of stent implantation improved clinical outcome as compared to angiographic guidance alone in the Can Routine Ultrasound Influence Stent Expansion (CRUISE) trial. Although no clinical outcome benefits were demonstrated with routine use of intravascular ultrasonography, a more effective stent expansion was noted when compared with angiographic guidance alone . Casella et al conducted a meta-analysis of studies done on this topic and demonstrated that intravascular ultrasound-guided stent implantation has a neutral effect on long-term death and nonfatal myocardial infarction compared with an angiographic optimization. However, it was noted that intravascular ultrasound-guided stenting significantly lowers 6-month angiographic restenosis and target vessel revascularizations. Intravascular ultrasonography consists of a miniature ultrasound-mounted catheter that is connected to an electronics console to reconstruct the images transmitted by sound waves. The ultrasound signal is produced by passing an electrical current through the piezoelectric (pressure-electric) crystalline material of the transducer that expands and contracts when electrically excited. After reflection from tissue, part of the ultrasound energy returns to the transducer. The received signal is converted to electrical energy and sent to an external signal processing system for amplification, filtering, scan conversion, user-controlled modification, and graphic presentation. The ultrasound beam upon reflection remains fairly parallel for a distance (near field) and then begins to diverge (far field). The quality of ultrasound images is greater in the near field because the beam is narrower and more parallel, the resolution is greater, and the characteristic backscatter (reflection of ultrasound energy) from a given tissue is more accurate.Therefore, larger transducers with lower frequencies are used for examination of large vessels because they create a deeper near field. An intravascular ultrasonography run from a segment of normal coronary artery. Di Mario C, Görge G, Peters R, Kearney P, Pinto F, Hausmann D. Clinical application and image interpretation in intracoronary ultrasound. Study Group on Intracoronary Imaging of the Working Group of Coronary Circulation and of the Subgroup on Intravascular Ultrasound of the Working Group of Echocardiography of the European Society of Cardiology. Eur Heart J. 1998 Feb. 19(2):207-29. [Medline]. Serruys PW, de Jaegere P, Kiemeneij F, Macaya C, Rutsch W, Heyndrickx G. A comparison of balloon-expandable-stent implantation with balloon angioplasty in patients with coronary artery disease. Benestent Study Group. N Engl J Med. 1994 Aug 25. 331(8):489-95. [Medline]. Fischman DL, Leon MB, Baim DS, Schatz RA, Savage MP, Penn I. A randomized comparison of coronary-stent placement and balloon angioplasty in the treatment of coronary artery disease. Stent Restenosis Study Investigators. N Engl J Med. 1994 Aug 25. 331(8):496-501. [Medline]. Mintz GS, Nissen SE, Anderson WD, Bailey SR, Erbel R, Fitzgerald PJ, et al. American College of Cardiology Clinical Expert Consensus Document on Standards for Acquisition, Measurement and Reporting of Intravascular Ultrasound Studies (IVUS). A report of the American College of Cardiology Task Force on Clinical Expert Consensus Documents. J Am Coll Cardiol. 2001 Apr. 37(5):1478-92. [Medline]. Chung H, Lee SJ, Park JK, Choi IS, Won HY, Kim S, et al. Spontaneous coronary artery dissection mimicking coronary spasm diagnosed by intravascular ultrasonography. Korean Circ J. 2013 Jul. 43(7):491-6. [Medline]. [Full Text]. Choi YH, Hong YJ, Ahn Y, Park IH, Jeong MH. Relationship between Neutrophil-to-Lymphocyte Ratio and Plaque Components in Patients with Coronary Artery Disease: Virtual Histology Intravascular Ultrasound Analysis. J Korean Med Sci. 2014 Jul. 29(7):950-6. [Medline]. [Full Text]. Chang M, Kang SJ, Yoon SH, Ahn JM, Park DW, Lee SW, et al. Plaque composition and morphologic characteristics in significant left main bifurcation disease; virtual histology intravascular ultrasound study. Coron Artery Dis. 2016 Dec. 27 (8):623-628. [Medline]. Frey AW, Hodgson JM, Müller C, Bestehorn HP, Roskamm H. Ultrasound-guided strategy for provisional stenting with focal balloon combination catheter: results from the randomized Strategy for Intracoronary Ultrasound-guided PTCA and Stenting (SIPS) trial. Circulation. 2000 Nov 14. 102(20):2497-502. [Medline]. Schiele F, Meneveau N, Gilard M, Boschat J, Commeau P, Ming LP. Intravascular ultrasound-guided balloon angioplasty compared with stent: immediate and 6-month results of the multicenter, randomized Balloon Equivalent to Stent Study (BEST). Circulation. 2003 Feb 4. 107(4):545-51. [Medline]. Laskey WK, Williams DO, Vlachos HA, Cohen H, Holmes DR, King SB 3rd. Changes in the practice of percutaneous coronary intervention: a comparison of enrollment waves in the National Heart, Lung, and Blood Institute (NHLBI) Dynamic Registry. Am J Cardiol. 2001 Apr 15. 87(8):964-9; A3-4. [Medline]. de Jaegere P, Mudra H, Figulla H, Almagor Y, Doucet S, Penn I. Intravascular ultrasound-guided optimized stent deployment. Immediate and 6 months clinical and angiographic results from the Multicenter Ultrasound Stenting in Coronaries Study (MUSIC Study). Eur Heart J. 1998 Aug. 19(8):1214-23. [Medline]. Fitzgerald PJ, Oshima A, Hayase M, Metz JA, Bailey SR, Baim DS. Final results of the Can Routine Ultrasound Influence Stent Expansion (CRUISE) study. Circulation. 2000 Aug 1. 102(5):523-30. [Medline]. Casella G, Klauss V, Ottani F, Siebert U, Sangiorgio P, Bracchetti D. Impact of intravascular ultrasound-guided stenting on long-term clinical outcome: a meta-analysis of available studies comparing intravascular ultrasound-guided and angiographically guided stenting. Catheter Cardiovasc Interv. 2003 Jul. 59(3):314-21. [Medline]. Orford JL, Lerman A, Holmes DR. Routine intravascular ultrasound guidance of percutaneous coronary intervention: a critical reappraisal. J Am Coll Cardiol. 2004 Apr 21. 43(8):1335-42. [Medline]. Tyczynski P, Chmielak Z, Pregowski J, Rewicki M, Karcz M. Intervention on the left main coronary artery. Importance of periprocedural and follow-up intravascular ultrasonography guidance. Postepy Kardiol Interwencyjnej. 2014. 10(2):130-2. [Medline]. [Full Text]. Li QH, Zhang Q, Li XL, Yin JF, Ji HG. A volumetric intracoronary ultrasonographic study of coronary bifurcation lesions. Eur Rev Med Pharmacol Sci. 2018 Feb. 22 (4):1094-1101. [Medline]. Li L, Dash D, Gai LY, Cao YS, Zhao Q, Wang YR, et al. Intravascular Ultrasound Classification of Plaque in Angiographic True Bifurcation Lesions of the Left Main Coronary Artery. Chin Med J (Engl). 2016 Jul 5. 129 (13):1538-43. [Medline]. [Full Text]. Mintz GS, Popma JJ, Pichard AD, Kent KM, Satler LF, Chuang YC. Limitations of angiography in the assessment of plaque distribution in coronary artery disease: a systematic study of target lesion eccentricity in 1446 lesions. Circulation. 1996 Mar 1. 93(5):924-31. [Medline]. Kovach JA, Mintz GS, Pichard AD, Kent KM, Popma JJ, Satler LF. Sequential intravascular ultrasound characterization of the mechanisms of rotational atherectomy and adjunct balloon angioplasty. J Am Coll Cardiol. 1993 Oct. 22(4):1024-32. [Medline]. Gil R, von Birgelen C, Prati F, Di Mario C, Ligthart J, Serruys PW. Usefulness of three-dimensional reconstruction for interpretation and quantitative analysis of intracoronary ultrasound during stent deployment. Am J Cardiol. 1996 Apr 1. 77(9):761-4. [Medline]. Evans JL, Ng KH, Wiet SG, Vonesh MJ, Burns WB, Radvany MG. Accurate three-dimensional reconstruction of intravascular ultrasound data. Spatially correct three-dimensional reconstructions. Circulation. 1996 Feb 1. 93(3):567-76. [Medline]. Rasheed Q, Dhawale PJ, Anderson J, Hodgson JM. Intracoronary ultrasound-defined plaque composition: computer-aided plaque characterization and correlation with histologic samples obtained during directional coronary atherectomy. Am Heart J. 1995 Apr. 129(4):631-7. [Medline]. Metz JA, Yock PG, Fitzgerald PJ. Intravascular ultrasound: basic interpretation. Cardiol Clin. 1997 Feb. 15(1):1-15. [Medline]. Nishimura RA, Edwards WD, Warnes CA, Reeder GS, Holmes DR Jr, Tajik AJ. Intravascular ultrasound imaging: in vitro validation and pathologic correlation. J Am Coll Cardiol. 1990 Jul. 16(1):145-54. [Medline]. Tuzcu EM, Berkalp B, De Franco AC, Ellis SG, Goormastic M, Whitlow PL. The dilemma of diagnosing coronary calcification: angiography versus intravascular ultrasound. J Am Coll Cardiol. 1996 Mar 15. 27(4):832-8. [Medline]. Schmermund A, Erbel R. Unstable coronary plaque and its relation to coronary calcium. Circulation. 2001 Oct 2. 104(14):1682-7. [Medline]. Kearney P, Erbel R, Rupprecht HJ, Ge J, Koch L, Voigtländer T. Differences in the morphology of unstable and stable coronary lesions and their impact on the mechanisms of angioplasty. An in vivo study with intravascular ultrasound. Eur Heart J. 1996 May. 17(5):721-30. [Medline]. Bocksch W, Schartl M, Beckmann S, Dreysse S, Fleck E. Intravascular ultrasound imaging in patients with acute myocardial infarction. Eur Heart J. 1995 Oct. 16 Suppl J:46-52. [Medline]. Hoffmann R, Mintz GS. Coronary in-stent restenosis - predictors, treatment and prevention. Eur Heart J. 2000 Nov. 21(21):1739-49. [Medline]. Mintz GS, Popma JJ, Hong MK, Pichard AD, Kent KM, Satler LF. Intravascular ultrasound to discern device-specific effects and mechanisms of restenosis. Am J Cardiol. 1996 Aug 14. 78(3A):18-22. [Medline]. Waksman R. Drug-eluting stents: from bench to bed. Cardiovasc Radiat Med. 2002 Jul-Dec. 3(3-4):226-41. [Medline]. Rickenbacher PR, Pinto FJ, Chenzbraun A, Botas J, Lewis NP, Alderman EL. Incidence and severity of transplant coronary artery disease early and up to 15 years after transplantation as detected by intravascular ultrasound. J Am Coll Cardiol. 1995 Jan. 25(1):171-7. [Medline]. Kapadia SR, Nissen SE, Tuzcu EM. Impact of intravascular ultrasound in understanding transplant coronary artery disease. Curr Opin Cardiol. 1999 Mar. 14(2):140-50. [Medline]. Kobashigawa JA, Tobis JM, Starling RC, Tuzcu EM, Smith AL, Valantine HA. Multicenter intravascular ultrasound validation study among heart transplant recipients: outcomes after five years. J Am Coll Cardiol. 2005 May 3. 45(9):1532-7. [Medline]. Mehra MR, Ventura HO, Stapleton DD, Smart FW, Collins TC, Ramee SR. Presence of severe intimal thickening by intravascular ultrasonography predicts cardiac events in cardiac allograft vasculopathy. J Heart Lung Transplant. 1995 Jul-Aug. 14(4):632-9. [Medline]. Isner JM, Rosenfield K, Losordo DW, Kelly S, Palefski P, Langevin RE. Percutaneous intravascular US as adjunct to catheter-based interventions: preliminary experience in patients with peripheral vascular disease. Radiology. 1990 Apr. 175(1):61-70. [Medline]. Bom N, Lancée CT, Van Egmond FC. An ultrasonic intracardiac scanner. Ultrasonics. 1972 Mar. 10(2):72-6. [Medline]. Colombo A, Hall P, Nakamura S, Almagor Y, Maiello L, Martini G. Intracoronary stenting without anticoagulation accomplished with intravascular ultrasound guidance. Circulation. 1995 Mar 15. 91(6):1676-88. [Medline]. Tuzcu EM, Kapadia SR, Tutar E, Ziada KM, Hobbs RE, McCarthy PM, et al. High prevalence of coronary atherosclerosis in asymptomatic teenagers and young adults: evidence from intravascular ultrasound. Circulation. 2001 Jun 5. 103(22):2705-10. [Medline]. Puri R, Nicholls SJ, Brennan DM, Andrews J, Liew GY, Carbone A, et al. Coronary atheroma composition and its association with segmental endothelial dysfunction in non-ST segment elevation myocardial infarction: novel insights with radiofrequency (iMAP) intravascular ultrasonography. Int J Cardiovasc Imaging. 2014 Oct 9. [Medline]. Alfonso F, Sandoval J, Pérez-Vizcayno MJ, Cárdenas A, Gonzalo N, Jiménez-Quevedo P, et al. Mechanisms of balloon angioplasty and repeat stenting in patients with drug-eluting in-stent restenosis. Int J Cardiol. 2014 Oct 23. 178C:213-220. [Medline]. An intravascular ultrasonography video highlighting the appearance of a branch from the main stem coronary artery. Note the coronary artery branch appearing at the 1'o clock position of the screen.